The trick is to have an assortment of capacitors, transistors, resistors, screws and other stuff you need without getting thrown out of the house for being a pack rat. So, with parts it’s best to get the right stuff and then keep it organized. Here are some general parts categories worth considering. CLICK HERE for a list of useful product purchasing links. Fresh Batteries If you collect pocket radios you need fresh batteries. Most of them, such as everyday AA, AAA and 9-volt items can be purchased in drug and discount stores. 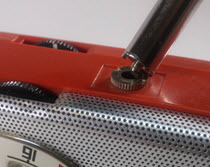 These are often on sale, so read that Sunday paper and pounce when the price is right.Some of the harder to find vintage batteries—Eveready 266, 640 button cells and such, need to be purchased online. Contemporary replacements for obsolete batteries. Alternately you can use adapters like these. Battery adapters make them play again. Vintage Replacement Parts Whenever possible I like to replace vintage parts with vintage parts. There are times when this is not possible. For example, vintage electrolytic capacitors, even if they have never been used before, are almost certainly not usable today. They have, or soon will become dried out.Vintage antenna coils, transistors, and perhaps even speakers, switches and volume controls are, however, all worth finding and keeping. I get mine from a variety of sources. Sometimes local service shops have them gathering dust in the back. You can find them on eBay. They can be pulled from old sets that are beyond restoration. 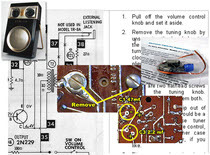 Do use the tips found throughout this site to test vintage parts of all kinds before installing them, and be slightly more skeptical of vintage parts than you are of new ones. New Parts You will surely want a complete collection of small, low voltage electrolytic capacitors. It will be handy to have an assortment of ¼-watt resistors around, although these will be rarely used.‘Same goes for small “disc” capacitors. The old ones do change value or short out on occasion, but this will not be an everyday occurrence unless you are repairing radios nonstop. 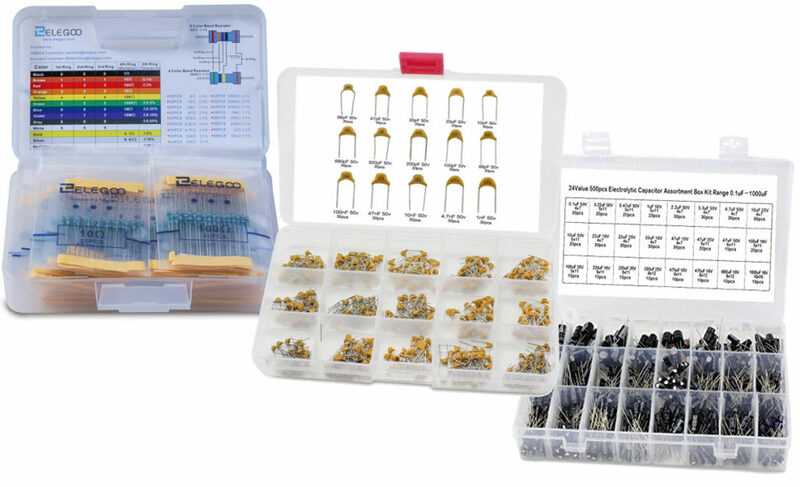 Amazon sells some nice resistor and capacitor assortments, complete with storage/organizing solutions, as shown here. Add some AA battery holders to your stockpile, and 9-volt battery clips as well. I keep some replacement flat metal battery terminals and springs on-hand as well. By the way, I really dislike using “universal” transistor replacements, and they often cause as many problems as they solve, particularly in vintage sets. Your mileage may vary. See what parts look like, learn their schematic symbols and more here.